The School House with the Green Door? On pages 194 and 195 in the Bayou Pigeon book, you will find a brief history of the beginning of the Bayou Pigeon School. The authors thought that any official (public) school history started with the purchase of property from the Anatole Berthelot Family to build a school. Recently doing some new research, we discovered some new information, i.e., records digitized and now available from the internet. This information is an official State report from 1930, and this document describes a school at Bayou Pigeon several times. In the table of contents above, and on page 12 and 18 listed below. 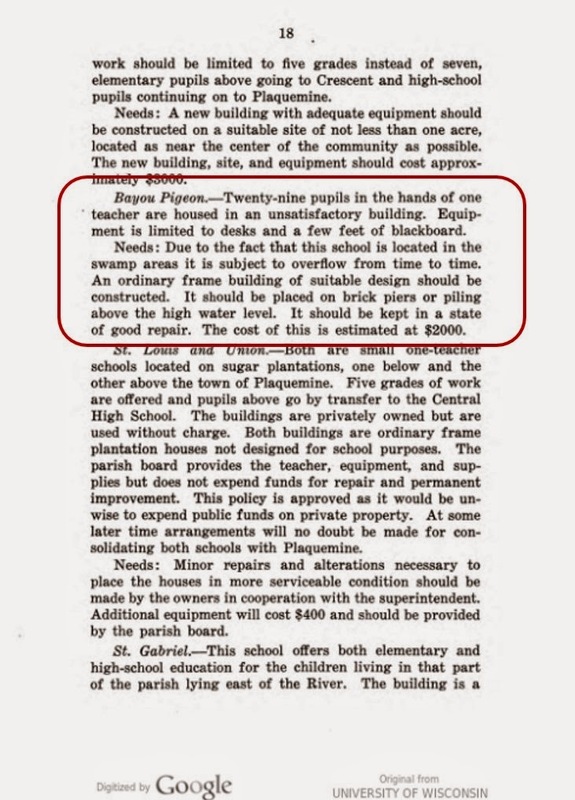 This 1930 document is officially recommending building a new school building at Bayou Pigeon. Which insinuates there was school at Bayou Pigeon, LA. prior to the school built on the Berthelot property. WOW, another I did not know that moment … for the authors, one of many. When researching and writing the book, verbal interviews of several reliable folks talked about a house, known as the “Old School House with the Green Door”. We covered that story in the book, see excerpt below. We were certain something existed, so much so we had Stan Routh do an illustration of the house for us, based on some verbal descriptions. 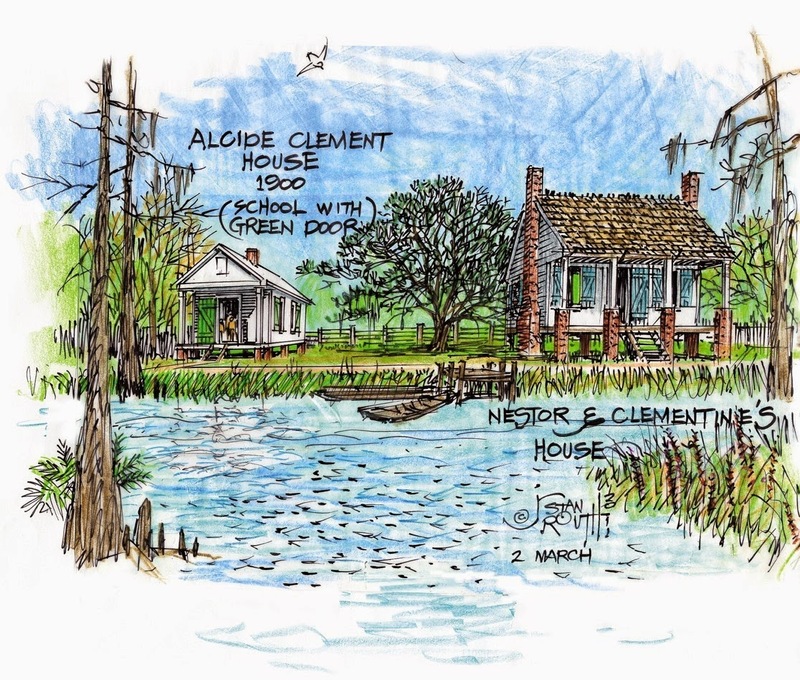 “The School House with the Green Door” was located next to the Nestor / Clementine Michel home. If you have the book go back and read Pages 119 – 125. This house was once the Alcide Clement Family home. It was also used for Sunday Mass (page 422) prior to the St Joseph Church Parish of Pierre Part, traveling chapel boat, “Our Lady Star of the Sea”. However, we could find no official records of a public school. The Iberville Parish School Board tells us they kept / have no records from that time period. We do know one-room grade schools were very common in the early 1900’s in rural Louisiana, i.e., Children from several grades sat in one room. We know there is a high probability “the old school house with the green door” is true. What we did not know at the time the book was written that it may well have been an official state sponsored public school, versus an informal school as we thought. The authors have been unable to confirm 100%, the year the school built on the Berthelot property was completed. School could have started there in Sept.1931-32 if they bought and built the school in six months which is possible. 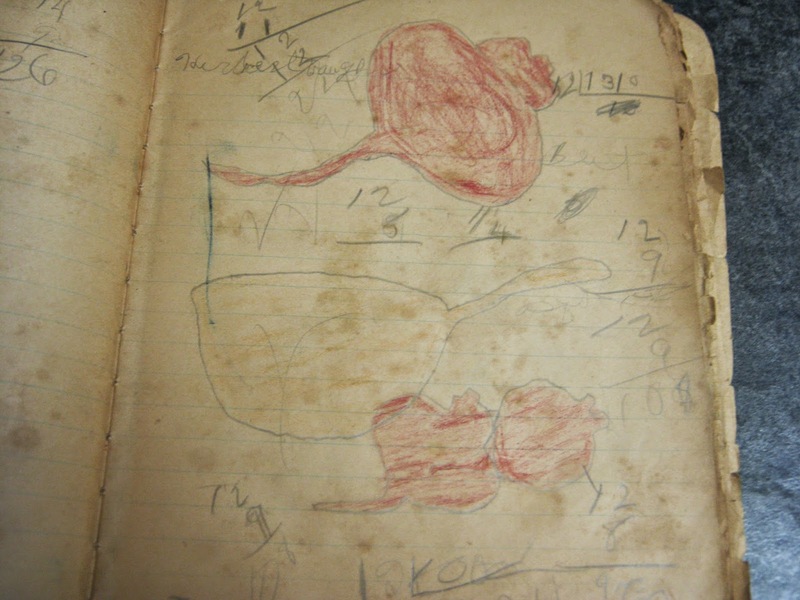 But we have concrete evidence that there were actual school studies in the fall of 1931, i.e., Herbert Vaughn’s workbook documents shown below. Which indicates fall of 1931. 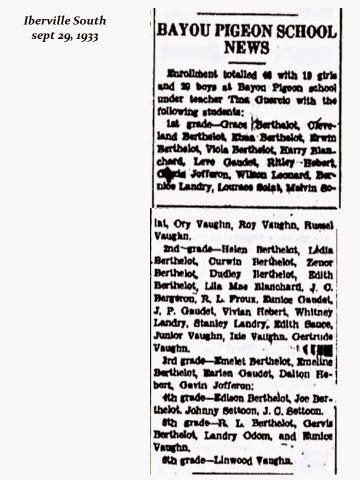 In the Sep. 29, 1933 issue of the Iberville South, it reported that 48 students were enrolled in the school at Bayou Pigeon. What is noteworthy is there are students in grades 1 thru 6. If this school was only 2 years old, How were pupils placed in the upper grades? 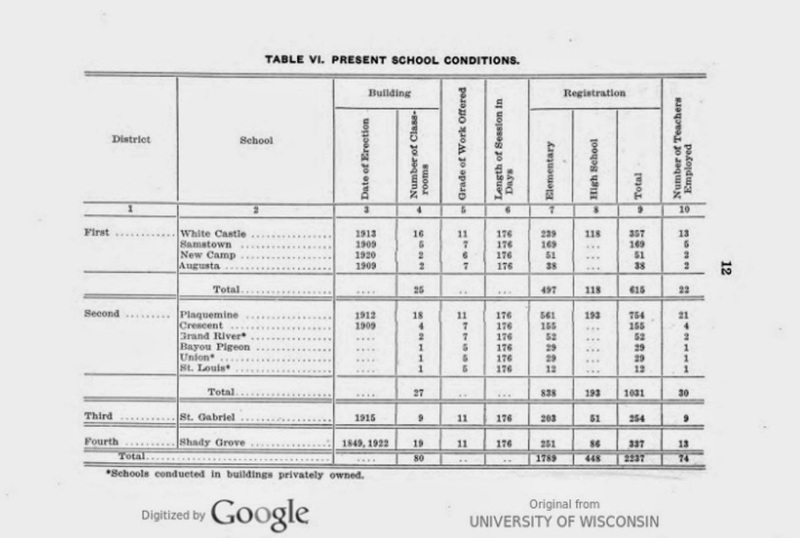 This suggests that there was a school for number of years prior to the school built on the Berthelot property. We have studied the above list and reprinted here with the correct spellings. There were several misspelling of names and there were some students that must have started attendance after the school year started and were not listed. We have other proof they were in school. We noted those as well. For the record it was common for boys in particular to miss school pretty often and for several days at a timewhen there fathers needed help fishing. Grace Berthelot ( daughter of Adolph Berthelot), Clevin Berthelot, Alma Berthelot (spouse of Pierre templet), Erwin Berthelot, Viola Berthelot, Harry Blanchard, Levee Berthelot, Ridley Hebert, Gloria Jofferon, Wilson Leonard, Bernice Landry, Laury Solar, Melvina Solar, Ory Vaughn, Roy Vaugnn, Russel Vaughn. Felix Berthelot was in school in 1933, but we don’t whu he was not listed. Helen Berthelot, Ledia Berthelot, Curvin Berthelot, Zenor Berthelot, Dudley Berthelot, Edith Berthelot, Lila Mae Blanchard, J.C. Bergeron. Orelle ( Aka R.L.) Frioux, Eunice Gaudet, J.P. Gaudet, Vivian Hebert, Whitney Landry, Stanley Landry, Edith Sauce, Junior Vaughn, Issac Vaughn, Gertrude Vaughn. 4 th grade: Edison Berthelot, Joe Berthelot, Johnny Settoon, J.C. Settoon. 5 th Grade: R.L. Berthelot, Gervis Berthelot, Odom Landry, Eunice Vaughn. Evelyn Vaughn was in school in 1933, but we don’t what grade he was in and why he was not listed the news paper report. Teacher - Ms. Tina Guercio ;Please note this is the first information on the Teacher. How did students and teachers get to the School? The white clam shell road (Hwy 75) from Bayou Sorrel to Bayou Pigeon was not completed until 1935. For the first 3 years of the new school building existence there was just a path on top of the dirt levee which paralleled Grand River. Teachers traveling from anywhere would have had to travel by boat, eg., could not reach the school in bad weather. Mr. Curtis Leonard from Bayou Pigeon in a verbal interview verified that in the late 1930's one school teacher, a Mrs. Harper and her husband, stayed with him and his widowed mother on their houseboat during the school year. Students made their way to school, by walking, boat and horses. Those on west side of Grand River crossed the river by boat to the school. Several students from the Choctaw Bayou area (Hwy 404-Grand River) rode horses to school. The Bayou Pigeon school house was heated in winter by a wood stove. At the beginning of a cold winter school day, the teacher put fuel in the wood stove and started a fire to warm the building. The long walk to the outhouse in winter was no fun! The teacher at the Bayou Pigeon School cooked the noon meal and at the end of the day, the teacher cleaned and swept the schoolhouse. In a one-room school, the students sat in rows by grade. As the teacher taught each class, all the other students (older and younger) heard all the lessons. And remember, no electricity at Bayou Pigeon until 1947! One of the main goals of education, of course, was and is to teach students to read, write and spell. 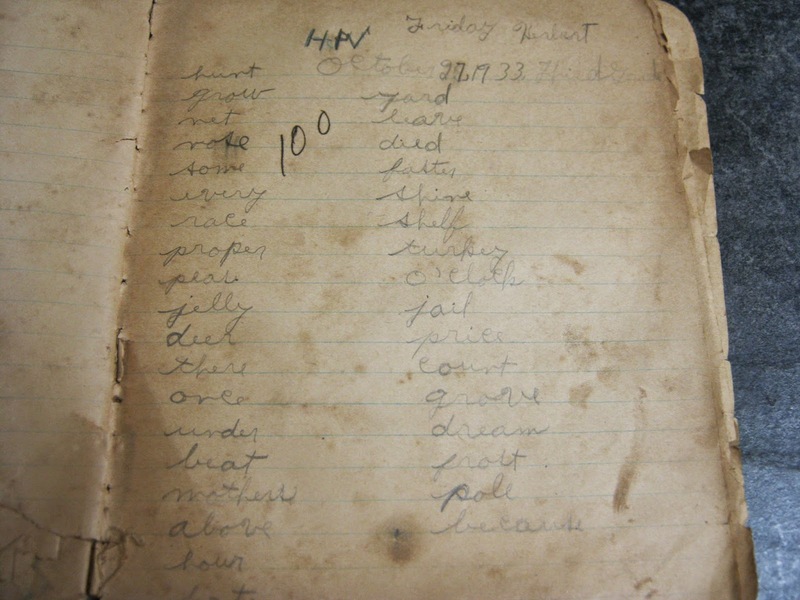 take note... an extra burden at Bayou Pigeon in the 1930's would have been to speak, read, write and spell in English !!!. Excerpt from the book page 195. 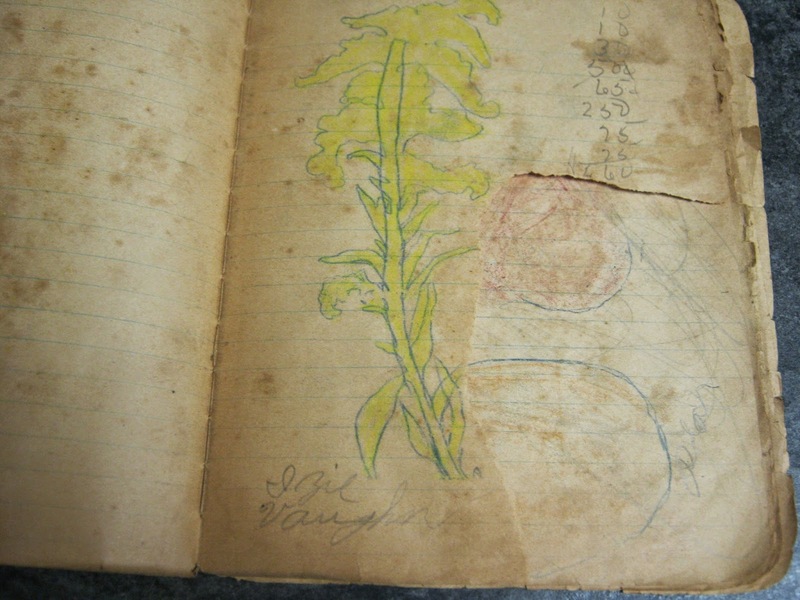 The work shown below was provided by Ms. Geraldine Vaughn Johnson and she got the workbook from her Grandmother, Ms Eurami (Teron) Michel Vaughn, daughter of Nestor Michel and wife of Aldores Vaughn. 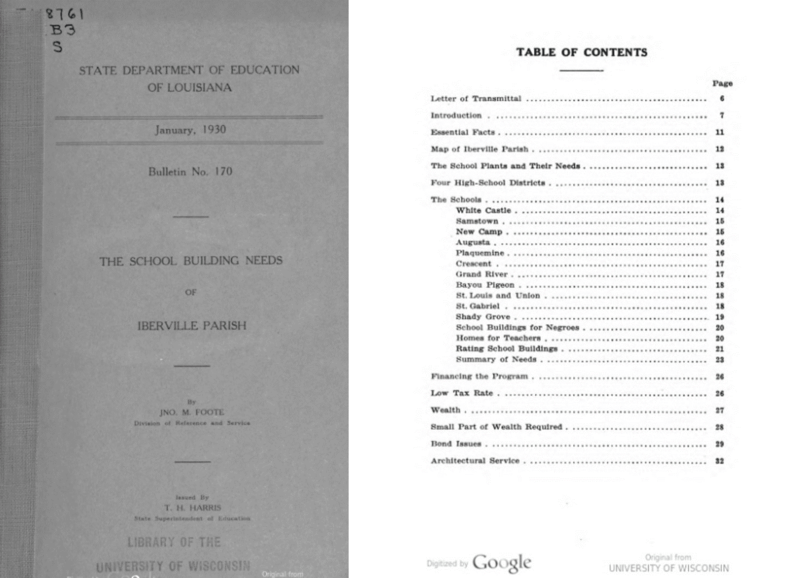 Note that this document corroborates there was school in the fall of 1931, if the school building / construction on the newly purchased Berthelot property was completed within / between April and Sept. it would be at the new school. It is possible the school could have been built and opened by Sept. 1931. The authors think that is the most likely scenario. Note the way he spelled his name. This document also corroborates that Herbert Vaughn and Evelyn (Herbert’s brother) Vaughn must have attended the Bayou Pigeon. There was some speculation since they were not included the newspapers article above, maybe they went to a school some where else. Since Isaac was listed in the same workbook information of his brothers and and listed on the 1933 article they would have all been at same school. Corrborating Evelyn was in school in 1933 with Herbert and Issac. 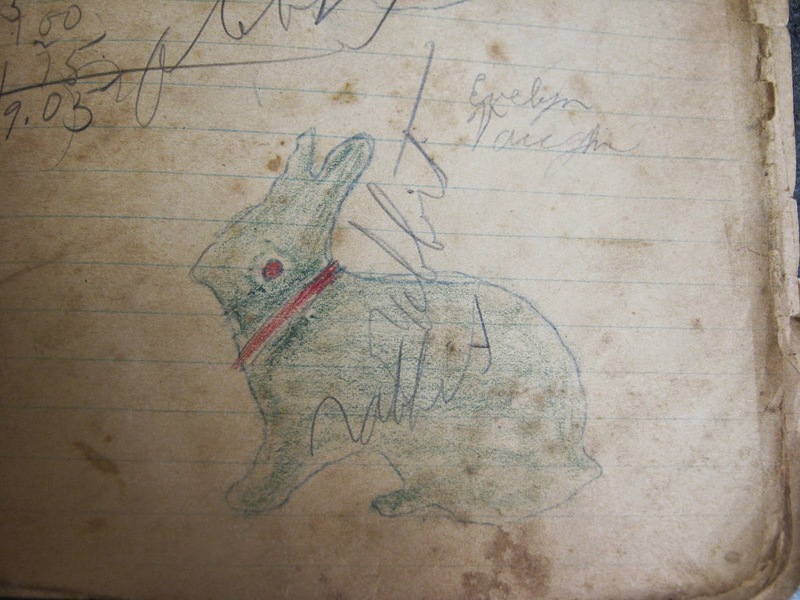 We have fielded many questions over the years about the book and the history contained in it. By all means, we trust that anyone who can help corroborate / add to and or correct any errors will contact us. The authors are at your service to help preserve, protect and perpetuate the heritage. Including submitting ideas to write about or writing a piece. Good writing is sort of hard, but is rewarding work – you’ll gain a huge amount of satisfaction of seeing your idea or writing for that matter in a finished posting. Special thanks to Ms. Geraldine Vaughn Johnson for submitting the school work book of her father, Herbert Vaughn and Uncles, Issac and Eveyln for publication. See more at the “All Things Bayou Pigeon blog.